A serial domestic abuser who broke into his ex-girlfriend's home and tried to stab her has had his sentence increased by appeal judges. Gambling addict Matthew White smashed his way into his victim's house through a window, armed with a large kitchen knife, and attacked her while her three children were upstairs. He terrorised her for 45 minutes, during which he threatened to kill her and her mother, who had come to her daughter's aid. White, 31, of Manor Way, Anlaby, Hull, who has a history of violence against ex-partners, was branded a danger to the public and given a six-year jail term at Hull Crown Court in May. His sentence was increased to nine years at the Court of Appeal on Thursday after three judges said the original term was too soft. The judges also increased his extended licence from three to five years. Lady Justice Hallett, sitting with Mrs Justice Andrews and Mrs Justice May, said: "The offender is dangerous, he has committed numerous offences against ex-partners. "In our view the sentence was unduly lenient." She told the court White went to his former partner's home at about 7.45pm on February 9 and knocked on the door. When she refused to answer it, he repeatedly kicked the door before smashing a window and climbing through it. The victim screamed as she saw him come at her with the knife and told her children to stay upstairs. White tried to stab her but she managed to grab hold of the blade and keep it away from her chest. He then grabbed her by the hair as she tried to run away and threw her to the floor, punching her three times and putting her in a headlock. When she tried to reach for her mobile phone he stamped on it, smashing it, and said he would kill her if she tried to call the police. She managed to call her parents, who drove to the house but stayed outside after White threatened to kill her mother if they came in. The incident came to an end when police arrived, and White told them his memory of events was "hazy". The victim, who suffered serious cuts to her hand, and her children were left terrified and thought they might have to move from their home. Lady Justice Hallett said: "He generally terrorised her and the children, and the impact upon them has undoubtedly been significant, if not very serious." White, who had gambling debts of £33,000, said he had been drinking lager before the attack, but was not drunk. The court heard he had previously been prescribed anti-psychotic medication for mental health problems, but had stopped taking them shortly before the incident. He was on bail for harassment at the time of the attack after sending his ex abusive and threatening messages and hacking her email and social media accounts. His previous offences included an incident where he set fire to a pair of curtains and told another former partner she would burn, for which he was jailed for four years and eight months in 2013. He also harassed his ex-wife and has a previous conviction for battery of his stepmother. 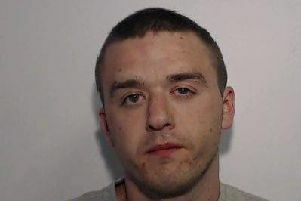 White admitted aggravated burglary and making threats to kill at an earlier crown court hearing. His sentence was referred to the Court of Appeal by Solicitor General Robert Buckland under the unduly lenient sentence scheme. Speaking after the hearing, Mr Buckland said: "Not only did White's actions directly impact his victim, but we can also only begin to imagine the long-term effects this is likely to have on the children who experienced this terrible ordeal. "It is only right that White should serve a longer sentence."